Bits: Etihad’s Business Class Studio comes to Manchester, Grand Hyatt opens in Athens, Virgin opens its pub! In an encouraging boost for the region, Etihad is swapping its morning departure from Manchester to a Boeing 787. This is the first time that Etihad has operated a 787 from the UK. This means that Manchester customers will be able to experience the hugely impressive Business Class Studio for the first time. It is one of the top 2-3 business class products on the market – you can read my review of the A380 version here. The evening flight from Manchester will remain as a Boeing 777 with a more traditional lie-flat seat. However, from 31st March 2019 there will be a switch with the 787 moving to the evening departure from Manchester. The Boeing 787 arrives on 1st November and the flights are already showing online at etihad.com. 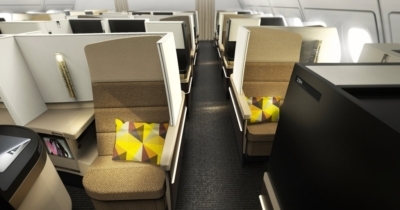 You can find out more about the Business Class Studio on the Etihad site here. If you are not already an Etihad Guest member, you can sign up here and receive 500 bonus miles. Hyatt Hotels Corporation has announced the official opening of the first Grand Hyatt in Greece. The 309 room hotel is only the second property of the group to open in Greece, after the Hyatt Regency Thessaloniki. The hotel is currently running an opening offer with room prices starting at €105. Rooms can also be booked with World of Hyatt points starting from 12,000 points per night, although I wouldn’t do that if you can pay €135 or less for cash. Virgin Atlantic and Delta have opened their pub! Virgin Atlantic and its joint venture partner (and 49% shareholder) Delta have opened their pop-up pub. I was down there last night for a couple of drinks to take a peek. 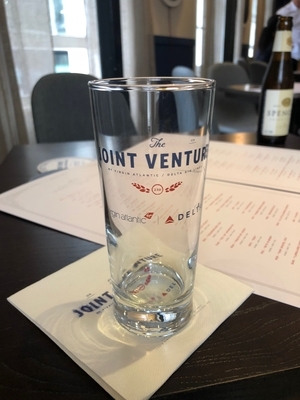 “The Joint Venture” is at 33 New Oxford Street and has taken over “The Old Crown” for the next 10 days. (New Oxford Street is not Oxford Street, it is to the east of Tottenham Court Road.) If you’re interested in craft beer then this is definitely one for you, as the pub is selling 230 different brands – one from each of the 230 cities which Delta and Virgin fly to in the US. It is open to the public from lunchtime today until Sunday 19th. There are various events planned throughout the week including quiz nights – details are on the Virgin Atlantic website here. PS. Apparently this person was there as well, not that I would know ….. So why is YOUR plane delayed? Because of the storms, or because other planes have to take off first, and these were delayed storms earlier in the day? Which airport are you at. I would check if other flights really are being cancelled that are leaving at the same time as yours. Weather issues with a plane they had lined up to come in and pick you up, is not a weather issue with your flights. The weather issue has to be with YOUR flight not with the airline’s inability to rustle up a plane that will land you within 3 hours of your original landing time, due to weather problems affecting other filights. You can google later to check asap, what other flights took off around the same time and the extent of any air control restriction. Having said that I have had generally truthful reasons from Easyjet. Whereas Ryanair apparently have changed their reason for delay or cancellation after the fact. to a reason that miraculously would not be eligible for EU261. Even had lies from LX about plane not taking off due to weather from ZRH . At a time when every other airline’s plane apparently had no difficulty taking off several of which were also going to similar places. Can’t reply to the latest message. We are at Gatwick. Now told we have the all clear but they don’t have the vehicle to move us to the runway so we’re just waiting…. O/T – I have reached the £10k spend on my BA Amex and received the companion voucher. If I cancel the card now and get a pro rata refund of the annual fee, do I lose the companion voucher or will it remain in my BA account? You keep it. Make sure you move the points out though before you close. Thanks for all the replies. Am I able to transfer the points out before they get automatically transferred at the end of the month? I can’t seem to find a manual way to do it. Thanks! It stays despite what Amex will tell you. If you’re worried about cancelling then downgrade to free BA Amex. Even Amex concede this keeps your voucher ! Or do as everyone else here does and just cancel entirely. As long as you have another Amex handy when you book your 2-4-1 you’ll be fine. O/T just had an email from marriott saying cannot use or upgrade existing travel packages between 18/8 and 18/9. So still no clearer on how they will convert legacy 7 night certificates. Yes and No. As this would have been the perfect opportunity to tell you what they are planning to do with them, you have to assume that some sort of mapping is now envisaged rather than a points refund. Indeed – an emails don’t seem to have been sent consistently, some with unattached packages (like me) haven’t received an email, yet those with attached packages have received an email! Am hoping cat 6 (old) will map to cat 5 (new) but bit annoying to have a one month hiatus before being able to book – although at least I’m not planning to use it for 6/12 time. The Etihad 777s are threadbare in business. The padding is gone and their are major lumps and bumps in the seat. Often a number of the seats don’t work. It’s a poor product which badly needs a refresh, but it’s unlikley to get one given EYs current financial state. There. Can we edit comments please Rob? ??? ?